When Harvard professor Robert Langdon accepts an invitation from his friend and former student Edmond Kirsch, technology guru and futurist, to attend an announcement at Spain’s Guggenheim museum, he has no idea what to expect. He is aware of Kirsch’s flair for drama and near-prophetic insight into the trends of scientific breakthroughs, but that hardly prepares him for the multi-media presentation Kirsch is about to unveil. Langdon doesn’t expect his former student to claim to have once and for all answered the most basic questions for humanity-where do we come from? Where are we going? He certainly doesn’t expect Kirsch to be murdered in front of a live audience, before he can answer those questions. Robert Langdon has had his share of adventures in the four previous novels from author Dan Brown, but none are quite like this. Once again, Langdon’s knowledge of symbolism and art history allow him to puzzle through clues and hidden meanings most would overlook, as he seeks to fulfill Kirsch’s last wish and release his presentation online to a swelling audience that includes religious and anti-religion fanatics, scientists and conspiracy theorists. Accompanied by Ambra Vidal, the museum director who has ties to the royal palace of Spain, Langdon uses the clues left behind by Kirsch and a remarkable AI the technologist developed named Winston to uncover the code needed to activate the presentation and perhaps change the world. Unfortunately, Kirsch’s assassin is still at large and has new targets-Langdon himself and Vidal. Meanwhile, insiders in the royal palace discover a link between Kirsch’s murder and an anonymous call from the palace just before the event. Did someone inside the palace order Kirsch silenced? Suspects include the crown prince, who is revealed to be Ambra’s fiancée, and Bishop Valdespino, the ailing king’s oldest friend. Or are they all the innocent victims of a conspiracy perpetuated by the rival Palmerian church, where the assassin is a member? As always, Brown delivers a story that draws deeply from the art, history, and scenery of its locations. He spins tales involving codes and intrigues from the ages, and weaves them seamlessly into plots full of action and mystery. Origin, though, adds another element from its doomed character, Kirsch, that of science fiction. This tale includes a surprising supporting character in the form of Winston, the next-generation computer AI that possesses the ability to act and influence the world, and take creative license with his creator’s instructions. 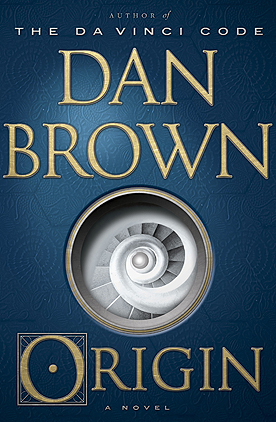 I will say this is the first time I’ve been able to pick up on some of the twists in a Dan Brown novel before they were revealed, but I was not able to do so until almost the end of the massive 456 page book. The scope of the story, the believability of the plot, and the epic journey still rate this book 5 stars and I would recommend it not only to current fans of Brown, but anyone interested in mysteries, sci-fi, and action/adventure stories.